The painting “Maslenitsa” was painted in modern style by the Russian artist Kustodiev BM. in 1916 All actions in the picture take place on the main square of a provincial town. In the foreground are pictures of people riding in a painted sleigh pulled by a pair of festively decorated horses with bells and an arc with bells. On the cheeks of people, rosy from the cold, smiles, joy, laughter. Nearby there are merchants selling merchants and visible citizens walking. The driver is barely holding back the top three horses. You can see how the happy kids ride down the hills, snowballs fly from the boyish fight. Downstairs, a bustling merry-go-round, a noisy fair, and crowds of people, now walking around, shopping, watching the show. A few more sleighs are also visible, the mass of celebratory fun is transmitted. Winter colorful landscape serves as an excellent background picture. The artist used an amazing palette of colors: turquoise, blue, gold and red shades. 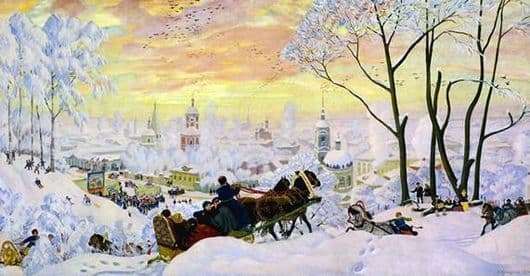 Parade of bright colors: pink and golden clouds are located on the emerald-green sky; the snow shimmers delicate – blue, pink and pale lilac flowers. Red and green patterns are used for the sleigh shades. The church, surrounded by trees, painted in bright colors. These colors were not chosen by chance, they emit the transmission of attitudes towards justice and faith, because white is a sign of kindness and purity. The bright sun is equipped with contrasts looming on the background of a snowy shroud. Snow sparkles in the sun, and frost flakes fall from the trees, and its amount in the picture makes it winter-smart. Looking at the picture, it creates a sense of presence on this festive holiday. She conveys the impressive warmth of this holiday. She is very optimistic and fully conveys moments of festivities to Shrovetide.